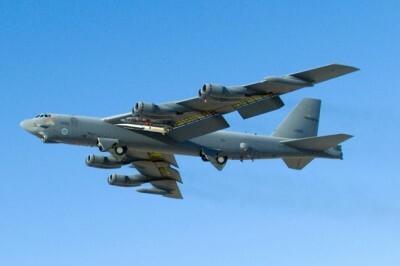 The US is considering deploying its massive Boeing B-52 Stratofortress long-range strategic bomber against Islamic State, a report citing US Air Force officials says. The aircraft is capable of simultaneously dropping 32 tons of bombs. The B-52s will replace several Rockwell B-1 Lancer supersonic strategic bombers, which had been striking terrorist positions near Kobani, Syria for several months and have now returned to their base in Texas, the Air Force Times reports. Defense officials also confirmed the information to Fox News. It has not yet been disclosed how many B-52s will be deployed against the jihadists. It also remains unclear which European military airfield the largest American bombers will be operating from. For over a year US warplanes pounding Islamic State (IS, former ISIS/ISIL) in Iraq have been taking off from airbases in Saudi Arabia and Qatar – America’s allies in the region. From August 2015, the US has been using Turkey’s Incirlik airbase to target terrorists in Syria. Although B-52 production ended back in 1962 (744 aircrafts built), the US Air Force still has 58 modernized models (18 in reserve). The last time B-52s were put into action was in the Afghan campaign. “We’re going to keep the B-52 around. It provides some missions for us that are hard to replicate, primarily the range and payload the airplane provides,” the Air Force Times said, citing Lt. Gen. James “Mike” Holmes, the deputy chief of staff for strategic plans and requirements, as saying on February 18. The B-52 Stratofortress bombers are set to remain in active service until at least 2040. Nuclear-capable B-52s are regularly deployed when Washington needs to demonstrate its military might to intractable countries. In early January, the US command deployed a B-52 bomber for a low altitude flight over South Korea to demonstrate its nuclear might and determination, following North Korea’s latest provocative underground nuclear test. In late December 2015, a B-52 bomber performed a demonstration flight over a man-made island in the South China Sea, which China claims sovereignty over. Beijing filed a complaint with the Pentagon over the incident. Since November 17, 2015, Russian strategic bombers, Tu-160s (Blackjack), Tu-95s (hug), and Tu-22s (Blinder), operating from airbases in Russia, have been delivering airstrikes against terrorist targets in Syria. While Tu-22s have been dropping conventional bombs, the Tu-160s and Tu-95s use long-range airborne Kh-101 precision cruise missiles. The air campaign in Syria was the first combat employment for the Tu-160 and Tu-95 bombers.